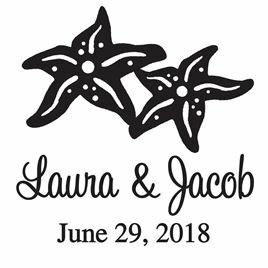 Embellish any and all stationery for your destination wedding with the adorable starfish design featured on this patent-pending custom stamp by PSA Essentials. Your names and wedding date appear below the starfish. Lettering only available as shown. Each stamp is packaged in a decorative paisley box. Stamp measures 2 1/4" x 5" and impression size is 1 5/8" in diameter. One black ink cartridge is included. This item will ship separately from the rest of your order. Please allow 10 days for production.